Punti Necessari: 2350 Please note that, for now, you cannot download content from our platform directly onto a mobile device (phone, iPod, iPad, tablets...). You need to download your items onto a PC or Mac, and then transfer them onto your device in the normal way. We are working on allowing direct downloads to mobile devices but this is not possible in the current version of the platform. Sorry about the inconvenience! NOTICE: Requires the base game Warhammer 40,000: Space Wolf in order to play. Activation key must be used on a valid Steam account. Requires an internet connection. About the game	Suspicious activity has been detected on the planet Kanak, deep in the Segmentum Obscurus. Sigurd Ironside, Iron Priest of the Adeptus Astartes Sixth Legion, known as the Space Wolves, travels forth to locate the sourc… e of these mysterious transmissions and see whether this activity poses any threat to the Imperium.This DLC offers you the opportunity to add a new ally whose help in the battle against the forces of Chaos will be invaluable, and also adds a collection of unique new weapon cards.Key features A new unique squadmate - Sigurd Ironside, the Iron Priest. Three Volkite Calivers with enough destructive power to reduce any foe to scorching substance. Two Lascutters that will slice through the armour of any enemy foolhardy enough to approach you. system requirements Windows - Minimum OS: Windows 7 Processor: 2.4 GHz Dual Core Memory: 2 GB RAM Graphics: Hardware Accelerated Graphics Network: Broadband internet connection DirectX: Version 11 Storage: 5 GB available space Additional Notes: DirectX 11 compatible GPU is required to play the game! Attempts on launching the game on systems which do not meet minimum requirements will cause crashes! Integrated GPUs may cause significant FPS drops! The game is not fully compatible with legacy AMD Radeon HD Video Cards which don't support DirectX 12! Windows - Recommanded OS: Windows 7 Processor: 2.4 GHz Dual Core Memory: 4 GB RAM Graphics: 1 GB Video Card Network: Broadband internet connection DirectX: Version 11 Storage: 5 GB available space Additional Notes: DirectX 11 compatible GPU is required to play the game! Attempts on launching the game on systems which do not meet minimum requirements will cause crashes! Integrated GPUs may cause significant FPS drops! The game is not fully compatible with legacy AMD Radeon HD Video Cards which don't support DirectX 12! 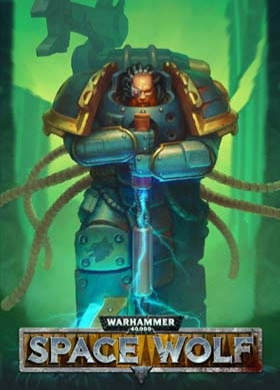 Warhammer 40,000: Space Wolf © Copyright Games Workshop Limited 2018. Space Wolf, Space Wolves, the Space Wolf logo, GW, Games Workshop, Space Marine, 40K, Warhammer, Warhammer 40,000, 40,000, the ‘Aquila’ Double-headed Eagle logo, and all associated logos, illustrations, images, names, creatures, races, vehicles, locations, weapons, characters, and the distinctive likeness thereof, are either ® or TM, and/or © Games Workshop Limited, variably registered around the world, and used under license. All rights reserved to their respective owners.